The amount of plastic waste generated every year in the UK is estimated to be about 3 million tonnes. It’s thought that 56% of all plastics waste is from packaging, and three-quarters is from households. 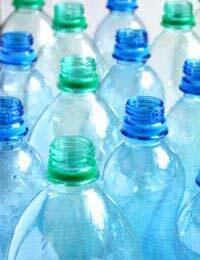 Plastic can be recycled, but plastics recycling is not as straightforward as the recycling of some materials. This is mainly owing to the number of different types of plastics that there are and the fact that recycling plastic is quite an expensive process. That’s why it’s better to reduce and re-use plastic as much as possible, then to recycle it when it can no longer be used anymore. Many people are confused about whether it’s safe to refill and re-use plastic water bottles because there are fears that the bottles can’t be cleaned properly and therefore harbour harmful germs. Others are more cynical/optimistic and think that information such as this is just a ploy to persuade people to buy another bottle of water rather than refilling from the tap. Advice from the Food Standards Agency says that refilling plastic water bottles should be fine as long as you clean them thoroughly. They do add a note of caution that if you have any doubt, or the bottle carries a message stating otherwise, it’s probably best not to re-use. If you’re worried you could always get a lightweight flask to fill with water and carry with you. Many people re-use plastic Ziplock and freezer bags. As long as you give them a thorough wash and dry you can get many more than one use out of these bags. If you get takeaways they are often delivered in plastic tubs these days. These tubs are excellent for freezing leftovers or using as a lunch box. You can also re-use plastic margarine and ice-cream tubs like this. If you have children plastic tubs and yoghurt pots can be used for all sorts of games, and art and craft projects. The tubs could be used for playing shop for example, or for mixing paint and glue. If you don’t have any children ask local nurseries and schools of they need any plastic pots. How about using plastic bottles as skittles and having a game of bowls, either inside or in the garden? If you have small plastic bottles, such as those that you get yoghurt drinks in, they can be handy for holidays or short breaks. Just clean them out well and top up with shampoo, shower gel, washing up liquid or whatever it is you want to take a small amount of with you. You’ll save loads of space in your packing too! A lot of people use plastic containers for growing plants. Plastic bottles can act like mini greenhouses and yoghurt pots are ideal for seedlings. More information on re-using waste in your garden is available in our article ‘Great 'Green' Ways to Re-use Your Waste in the Garden’. Plastic is an extremely durable material so it’s likely you can get loads more use out of it than you imagine before you send it for recycling. It just takes some thinking outside the (plastic) box.